Located near the mouth of the Selangor River, the fort complex at Kuala Selangor actually consists of two forts – the larger stone fort of Kota Malawati on Bukit Selangor and a smaller earthworks fort on Bukit Tanjong Keramat about a kilometre and a half to the northeast. Protected by steep hill slopes, flanked on three sides by a sharp bend of the Selangor River and surrounded on all sides by thick mangrove swamps, it was an ideal defensive position for a fort. 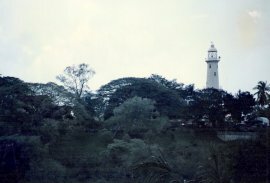 Its position on the mouth of the Selangor river, with a panoramic view of the Straits of Melaka and the Klang Valley, also gave the fort vital strategic importance. The fort was first constructed some time in the early 16th century by Tun Mahmud, a son of Sultan Mahmud, the last Sultan of Melaka, from which he administered the state on behalf of the Johor empire . The Bugis established themselves in Selangor in the 17th century and installed Raja Lumu as Selangor’s first Sultan in 1756. 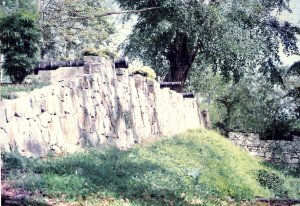 Raja Lumu, who took the title Sultan Salehudin Shah, established himself at the Kota Malawati, replacing its earlier earthworks with stout stone walls and ringing its perimeter with cannon. 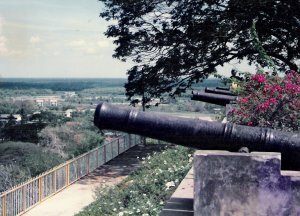 Sultan Ibrahim Shah who succeeded him further improved the fort’s defences with the construction of additional walls at the base of the hill and the placement of even more cannon, including a huge cannon with the name of Seri Rambai. 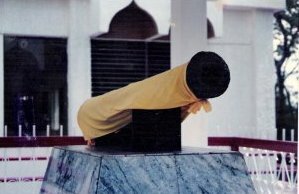 A gift from the Sultan of Acheh, this cannon was originally given by the Dutch to Sultan Riayat Shah Shah III of Johor but was captured by the Achinese when they sacked his capital in 1613. 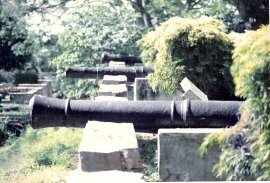 According to Dutch records, the fort was at the time was equipped with a total of 68 cannon. It was also at this time that the second earthworks fort was built at Bukit Tanjong Keramat, to help support the main fort from any surprise flanking attacks by sea. Because Selangor allied itself with the Achinese when they attacked Dutch Melaka in 1784, a fleet of 11 Dutch ships led by Dirk van Hogen and several vessels belonging to their ally, Raja Muhammad Ali of Siak, sailed to Kuala Selangor in July that year and shelled the fort mercilessly for two weeks. On August 2, a combined force of Dutch troops and Siak Malays landed and stormed the hill, driving Sultan Ibrahim’s forces into the surrounding jungle. The Dutch occupied the fort, renaming Kota Malawati ‘Altingburg’ and calling Kota Tanjong Keramat ‘Utrecht’. The Dutch strengthened the fort with stouter walls and larger cannon, and built a lighthouse on the hill summit. However, their stay at Altingburg and Utrecht was to be short-lived. Less than a year later, on 28 June 1785, Sultan Ibrahim’s forces, with the help of 2,000 Pahang Malays, launched a surprise night attack on the fort immediately after evening Isyak prayers and overwhelmed it completely. The Dutch garrison under Gerardu Zwykhardt and August Gravensteyu were driven back to the sea. Another Dutch fleet was dispatched shortly and succeeded in blockading the fort for over a year. However, the Dutch did not dare launch any land attacks on its stout defences and steep hills and the fort was to remain in Malay hands until British gunboats pounded it to submission in 1871. It is unsurprising that a fort so steeped in history would also be the subject of myth and legend. 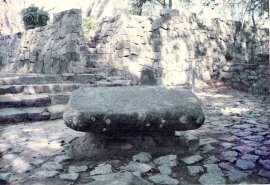 At the entrance to the main courtyard on the summit of the hill is a large rock tablet and it is said that a palace maiden was beheaded at the rock for allegedly having an affair with someone outside the palace. According to the legend, her blood poured all over rock and nearby areas to serve as a reminder to other women not to commit adultery. Even today, red sap runs from a nearby tree, often referred to as Pokok Berdarah (the Bleeding Tree), and many believe this to be the blood of the beheaded maiden. However, English sources provide a different twist to the tale. On the day the British gunboat Rinaldo shelled the fort, the Malays saw that the place was no longer tenable. A Malay chief is said to have cut the throat of an innocent girl and scattered her blood over the guns that he was forced to abandon. Her body was left on a large slab of stone before the main gate of the fort, a slab which is still shown as "the Stone of Sacrifice", because the murder was understood at the time to represent the blood-offering of a human victim as a prayer for victory. Most probably the poor girl was killed in order that her vengeful spirit should haunt the guns of the fort and make them a curse and a danger to the men in whose hands they were to fall. 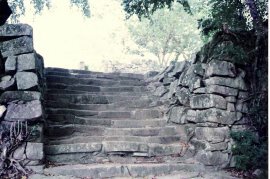 On the narrow stone path leading to the entrance of the fort is also located a Poisoned Well which was used to execute traitors. It was filled with a poisonous mixture of latex and juice from bamboo shoots and victims were lowered into the well to a slow and painful death. 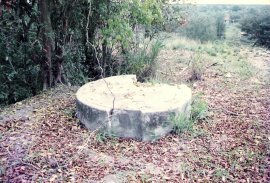 There are many Malay forts in the Peninsula that have such poisoned wells and it was probably a commonly-used form of capital punishment.. 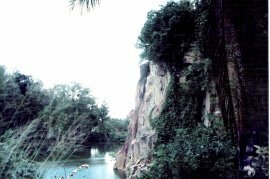 The origin of the name of Bukit Tanjung Keramat also involves a maiden. It is said that there was once lived a young local girl named Rabiah who vanished without a trace just before her wedding day. Rabiah had gone to a nearby pool, just below (Bukit Tanjung Keramat) to draw water but, unfortunately, that was the last anyone saw of her. Her family searched frantically for but all they found was her scarf, hanging from a branch. That night, she appeared to her parents in a dream, telling them that she had gone somewhere very peaceful and that there was no need to look for her. Rabiah’s parents then dedicated a shrine (‘keramat’) to her at the spot where the scarf was found and the hill had been known as Bukit Tanjung Keramat ever since. To this day, people visit the shrine asking for favours and bringing offerings such as chicken, flowers, fruit and incense.